Based on a study conducted by USATODAY.com, wages now account for the lowest shares of Americans' income since the government started to keep statistics in 1929. And, a record 18.3% of the nation's total personal income comes from payments made by the federal government. Those payments are made pursuant to Social Security, Medicare, food stamps, unemployment benefits, and other federal programs. The U.S. Dollar Index hit a new two year low yesterday, DXY Index Chart, as the USD continued its slide against a basket of 6 currencies. MarketWatch This most recent slide in the USD's value is pretty much across the board. One AUD will now buy more than 1.09 USD. AUDUSD One CAD will more more than 1.05 USD. CADUSD=X. Gold rose over $14 per ounce yesterday. Live Gold, Silver Spot Gold Price Silver is near $50 an ounce. The ETN for the DJ-UBS commodity index (DJP) is trading well above its 200 day moving average line: iPath Dow Jones UBS Commodity Chart I own two "principal protected" notes with $10 par values whose coupon payments are linked to the performance of that index. The Federal Reserve's balance sheet has hit an all time record, possibly they can make a tender offer for the S & P 500 companies with the 2.695 trillion dollars currently on their expanding balance sheet. No, I don't think that would be enough. More money needs to be created. Maybe in a few years those USDs can replace monopoly money. United Bankshares (UBSI) reported 1st quarter net income of 17.9 million or 41 cents per share, up only slightly from the 40 cents earned in the year ago quarter. As of 3/31/2011, NPLs to total loans were at 1.4%; the efficiency ratio was okay at 53.44%, the coverage ratio was comforting at 100% (peer group average was 77.6% as of 12/31/2010): the total risk based capital ratio was estimated at 13.9%, and the net interest margin was relatively good at 3.92%. The capital ratios are clean in that there is no government money providing equity capital. In previous posts, I indicated a desire to sell UBSI when the price hit 30. I have expressed that desire twice and have yet to sell the shares even though I could have done so at that price. There are a few reasons for holding UBSI. The dividend yield at my constant cost is around 7.25%, based on the current annual rate of $1.2 per share. Bought 50 of UBSI at $16.56 The bank also appears to be relatively well run, meaning that a swashbuckler Master of Disaster is not in charge. It is important that the bank made it through the Near Depression period without cutting the dividend. And, the bank has been moving into higher growth areas outside of its base in WV. I would also view the bank as a potential acquisition target. Some countervailing considerations is that the dividend growth rate is anemic. The annual dividend in 2003 was $1 per share and is now $1.2 in 2011. The earnings growth rate and the payout ratio suggests that trend is likely to continue. I also have a decent percentage long term capital gain in the shares. United Bankshares has 111 branches mainly serving West Virginia and the District of Columbia metropolitan area. The bank has about 10% of the deposits in WV. The bank has grown with almost 30 acquisitions since 1982. Bridge Bancorp (BDGE) reported a 1st quarter E.P.S. of 34 cents or 36 cents without the acquisition costs associated with its purchase of Hampton's State Bank. The core net income number was 9% higher than the 1st quarter of 2010. As of 3/31/2011, the net interest margin was relatively good at 4.14%; loan growth was at 15% compared to the first quarter of 2010; deposits grew 20%; the total capital to risk weighted assets ratio was 13.6%; the tier 1 capital to risk weighted assets was 12.3%; NPLs to total loans were at 1.43%; the allowance for losses to NPLs was a comforting 120.67%; and the efficiency ratio was okay at 61.72%. Bridge did not participate in TARP: SEC Filed Press Release In my parlance, its equity ratios are clean. Bridge is a new edition to the regional bank basket strategy. I am reinvesting the dividend. Bought 50 BDGE at 23.11 Bought: 50 BDGE @ 22.14 I am a few bucks in the red so far. Community Bank System (CBU) reported net income of 16.2 million, a 15.4% increase over the 1st quarter of 2010. Earnings per share were up 14.3% to 48 cents per share, including a 1 cent acquisition related expense. This was the Wilber acquisition which was owned at the time of the merger announcement. The consensus estimate made by 5 analysts was for 46 cents per share in earnings. CBU Analyst Estimates CBU is a new addition to the regional bank basket strategy, and I am near break-even so far. Valley National Bancorp, one of my larger holdings in the regional bank basket, announced after the close yesterday that it will acquire State Bancorp (STBC), based on a fixed exchange ratio of one VLY share for each share of STBC. State Bancorp is a small bank with 17 branches and provides Valley an entry into the Long Island market. Upon completion of this acquisition, VLY is expected to become the 37th largest commercial bank in the U.S. Last year, Valley acquired two banking institutions, Liberty Pointe and The Park Avenue Bank (Form 8-K), in an FDIC assisted transaction. SEC Filed Press Release announcing the Park Avenue Bank Acquisition SEC Filed Press Release announcing the LibertyPointe Bank Acquisition I discussed VLY's first quarter earnings' report in yesterday's post. 2. Coca Cola (own: Common Stock Dividend Growth Strategy): Coca Cola missed the consensus estimate by one cent. The company reported a net income of 1.9 billion or 82 cents. On an adjusted basis the company reported 86 cents per share. KO grew earnings in the first quarter by 18%, with 6% worldwide volume growth or 5% excluding new products. North American volumes were up 2%. This report is discussed at several financial sites including MarketWatch, Bloomberg, and Reuters. I recently quit reinvesting the dividend to buy additional shares. I have booked some profits on KO shares but still owns shares bought in March 2009 at $38.72 and two 50 share purchases in April 2010. ADDED 50 KO AT 54.26 (4/7/2010 Post) Bought 50 KO at 53.77 (4/24/2010). I go into some detail about KO's dividend growth in Item #1 Barrons (August 15, 2009 Post). The current quarterly dividend is 47 cents per share: Coca-Cola - Press Center - Quarterly Dividend The annual dividend rate per share was 88 cents in 2003 and $1.76 in 2010. This bond is the underlying security in the Trust Certificate PJS which I also own. TCs are in effect Exchange Traded Bonds. I have bought and sold that TC many times and have already booked some significant capital gains. Since I have owned that TC in various quantities for over 2 years, I have also received several semi-annual interest payments. Bought PJS at 7.2-October 2008 Bought 50 PJS at 17.95 August 2009 Bought 50 PJS at $17.8 in Roth Sold ALL PJS at 24.75 & 24.65 Bought 50 PJS at 23.73 Sold PJS at 25.45 Bought 50 of the TC PJS at 24.84 Bought 50 PJS @ 24.6 This TC has the same 7.55% coupon as the underlying bond: www.sec.gov I currently own 150 shares and this security just went ex interest for its semi-annual interest payment. Preferredplus Trust Series Far 1, PJS Stock Quote Since I now own the underlying bond, I may sell 50 or 100 shares of my TC position when and if the price exceeds the $25 par value. By buying the bond directly, I received a slightly better current yield and YTM compared to buying more PJS. This bond will be harder to trade than the exchange traded TC. I look at what can be bought in small amounts in the bond market at least twice a day and this bond has not been available in less than a 5 bond lot until Tuesday over the past several months. And, no bids have ever been shown for this bond for as long as I have looked at it, so I suspect that it will be virtually impossible to sell a 1 bond position. Twenty bonds were available when I placed my order, with the minimum lot being 1 bond, so I bought just 1. This is a link to the FINRA information about this bond. The current consensus estimate for CLGX is for an E.P.S. of $1.12 in 2011 and $1.29 in 2012: CLGX Analyst Estimates | CoreLogic, Inc. A description of this company can be found at Reuters.com, and I also reviewed the Key Developments page at Reuters.com even though I am already familiar with this company. This is a link to the recently filed Annual Report: form10k I will always try to review the most recent information that falls under the headings of "long term debt" and "liquidity and capital resources.". (see pages 43-46; and pages 68-70). Some of the history of the 7.55% bond can be found at page 45 and at page 70. It is listed among the long term debt obligations at page 68. My confirmation states that the current yield at my cost is 7.883% and the YTM is 8%. 5. Bought 1 Travelport 11.875% Senior Sub Bond Maturing on 9/1/2016 at 92 Last Tuesday (Junk Bond Ladder Strategy) (see Disclaimer): This brings me up to 3 Travelport bonds, which is precisely three more than the OG's comfort level. The yield enticed the RB to lobby the OG, who is obviously suffering from some sort of old age issue, to buy one more. It will not be long, LB added for good measure, before the OG embarrasses all staff members by leaving HQ without his pants. It was noted by several staff members here at HQ that the OG's hand was trembling before hitting the buy button, and he was heard to mutter "I don't want to start eating at Mission's soup kitchen, they do not even have cheeseburgers". This is a link to the FINRA Information on this bond. It is of course rated DEEP into junk terriotory and would be characterized by any sensible person as very risky. Please note that it is a "senior subordinated" bond. LB calls that kind of bond a junior bond. It is junior to both senior unsecured debt and senior secured debt. You would be hard pressed to find a "senior subordinated" bond that is senior to any bond in the capital structure. This is a link to the recently filed Travelport 2010 Annual Report: 10-k It would be nice to see the company turn a profit for a change (see page 39). The company did report revenues of 2.29 billion dollars in 2010 and a net loss of 43 million, which RB characterizes as a vast improvement over the 871 million lost in 2009. LB disclaims any connection with anything the OG and its Nit Wit ally are doing now in either the LT strategy or the Junk Bond Ladder Strategy. My confirmation states that the current yield at my cost is 12.796% and the YTM is 13.813%. It also shows that Moody's rates this bond at Caa1 and S & P has it at CCC. The OG regards ratings that begin with the letter "C" to be equivalent to flashing red lights and blaring warning sirens. Notwithstanding overwhelming and reliable evidence proving that OBAMA was born in the U.S., a majority of Republicans preferred to believe otherwise, based on their own unique form of reality creation. Now that the official birth certificate has been released, in addition to the certificate of live birth released before the election, you would think the issue might die some. Needless to say, two of our nation's leading TBs, Sarah Palin and her soulmate Glen Beck, are now claiming that OBAMA released the certificate to distract the media from Bernanke's news conference. It is impossible to have any confidence in a person's judgment after they have repeatedly proved their inability to distinguish fact from fiction. One of the more important upcoming events will be the end of QE 2 in June. It is interesting. The U.S. Federal Reserve is one of the main buyers of debt being issued by our U.S. Treasury Department. The FED is simply creating money. So, who is going to buy that enormous amount of treasury paper when one unit of the U.S. government stops buying the paper being issued by another unit. Will interest rates go up or down? My attitude is to make my best judgment and to act accordingly. I agree with Bill Gross who has started to short U.S. government debt, in effect betting that interest rates will rise and the value of existing U.S. debt will fall in value. A contrary position is being taken by other bond managers. WSJ.com The Federal Reserve did indicate yesterday that it will complete the 600 billion dollar purchase of treasury securities in June. FRB: Press Release--FOMC statement--April 27, 2011 However, given its more upbeat assessment about the economy, I would seriously doubt that it will launch QE 3 anytime soon. The Fed noted that "the economic recovery is proceeding at a moderate pace and overall conditions in the labor market are improving gradually". The FED also announced its intent to continue its Jihad against savers by keeping the Federal Funds rate at the artificially low range of 0 to .25% for "an extended period". In the judgment of staff here at HQ, this is going to end up bad by creating more asset bubbles and inflation, the most noticeable impact now is the acceleration in the real CPI (cash inflation excluding "owner's equivalent rent"). Besides the sheer amount of government debt that has to be issued to fund a trillion plus dollar annual deficit, and to retire maturing debt, inflation appears to be creeping up and cash inflation is certainly accelerating at an uncomfortable pace. If the politicians in Washington manage to cut spending some, and reach a stalemate on raising taxes, the increased interest costs on the national debt will swamp whatever spending cuts that are likely to be made. The current interest on the national debt could easily increase over 400 billion per year with just a return to normal rates. If you want to become sick, just look at the interest paid in the current fiscal year, starting 10/1/2010: Government - Interest Expense on the Debt Outstanding And, that number is at abnormally low interest rates. This expense is not going to get any better, and will likely become much worse. A trillion dollar per year interest expense on the national debt is certainly a possibility within 10 years, maybe even sooner. The interest expense for fiscal 2010 was $413,954,825,362.17. I do not own any U.S. government debt other than some individual TIPs maturing in 2019, a TIP mutual fund and a bond CEF that invests in TIPs which I have bought and sold many times. I do own some Canadian government debt. My main interest rate risk is in long term corporate bonds, mostly investment grade, and a few bond CEFs that do not have term dates. I have decided to start a small hedge for those positions by buying TBT, the double short for the 20+ year U.S. Treasury. I will consider averaging down on this position but will not average up. 1. Bought 40 TBT at $36.58 on Monday (see Disclaimer): TBT is what I call a double short ETF. As a conservative person, I would regard any security that attempts to double short anything to be dangerous. I am not making a bet with this security. Instead I am creating a hedge for an unexpected rise in interest rates. The treasury bonds will be the most sensitive in price to a rise in rates due to their perceived lack of credit risk. This is the way that I look at it. Since I built my home in 1982, where I still reside, I have paid Travelers insurance company every year to insure it. I have yet to make a claim under my Homeowner's policy. Was that a mistake?Sometimes, I just feel more comfortable buying some insurance even if nothing bad actually happens. And, I am not exactly confident that U.S. government debt is going to hold its value in the coming years. Disaster on the horizon is more of how I would characterize the prospects for our nation's debt. In the last analysis, however, no one can predict the future. My house may never burn to the ground or be hit by a tornado and long term treasury bonds may rise in value to yield 2.5% again on the 30 year. I have in the past discussed at length the tracking problems associated with TBT. The sponsor states that the goal is to seek a return equal to -200 of the Barclays Capital 20+ Year U.S. Treasury Index "for a single day". ProShares ETFs: UltraShort 20+ Year Treasury – Overview After one day, the ETF may start to lose tracking with the index and the divergence can become significant. And, it needs to be kept in mind what happens when the index goes up in value. While the double shorts have several problems, they do give me more bang for the buck than a simple short of an ETF like iShares Barclays 20 Year Treasury (TLT). However, since I do not have a margin account, I am not set up to short securities, but I can buy ETFs that take short positions. TBT has declined some since my purchase until yesterday. I expect this security to be volatile in the coming months. 2. 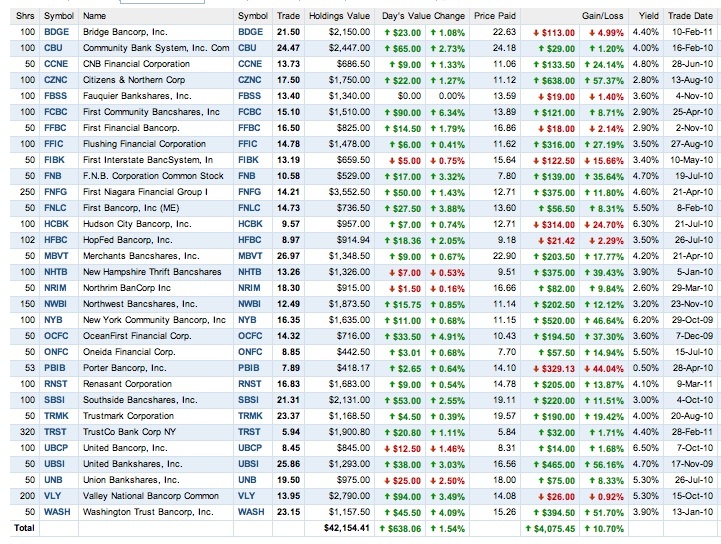 Bought 100 shares of First Community Bancshares (FCBC) at $13.89 Last Monday (Regional Bank Stocks' basket strategy)(see Disclaimer): First Community Bancshares has 59 branches in five states: Virginia, West Virginia, Tennessee, North and South Carolina: fcbresource.com The bank has its headquarters in Bluefield, VA. 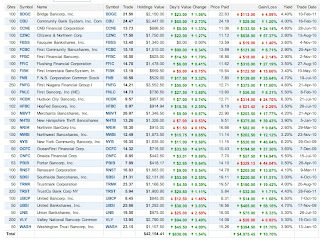 I had the bank on my monitor list for regional banks that has over 100 stocks. I thought that the recent earnings release was good, so I pulled the trigger and bought 100 shares last Monday at $13.89 in a satellite brokerage account. The regional bank basket strategy is sufficiently large to be material to me. The Lottery Ticket Strategy in its totality is not material. I have been buying some regional banks as part of the LT strategy and do not intend to monitor them. I will monitor all of the stocks in the Regional Bank Basket Strategy. FCBC closed at $14.2 on Monday up 45 cents on below average volume. The consensus forecast for the 1st quarter, made by seven analysts, was for an E.P.S. of 25 cents. First Community Bancshares reported earning of 5.75 million or 32 cents per diluted share. As of 3/31/2011, FCBC reported a total risk-based capital ratio of 15.81%; a tier 1 risk-based capital ratio of 14.55%; a tier 1 leverage ratio of 9.66%; a tangible book value per share at $10.48, up 45 cents from 12/31/2010; and a net interest margin of 3.96%. The annual dividend per share hit $1.12 in 2008 before being slashed by the bank to 30 cents in 2009. The annual rate was raised to 40 cents per share in 2010 and has not been raised since then. The bank share's hit a high of $42.3 intra-day on 2/8/2007 (FCBC Historical Prices) before sliding to a low of $7.9 on 3/6/09. For banks on my monitor list, I will make a very quick review of earnings releases. If I see something interesting, I will read the entire release which I did shortly after the announcement from FCBC. I then decided to add the stock to my basket. Northwest Bancshares (NWBI) reported 1st quarter net income of 17.3 million or 16 cents per share, up 31.1% over the same quarter in 2010. The estimate was for 15 cents. The Board increased the quarterly dividend by 1 cent to 11 cents per share. As of 3/31/2011, NPLs to total loans was high for the banks in my basket at 2.85%, up from 2.16% in the 1st quarter of 2010; allowance for loan losses as a percentage of NPLs was an uncomfortable for me 48.96%; the net interest margin was 3.66%, up from 3.32% in the year ago quarter; tangible common equity to assets was excellent at 13.99%; tangible book value per share was $10.32; and the number of banking offices was at 172. Through 3/31, the bank had repurchased 3,173,423 million shares at an average cost of $11.96 per share. Northwest Bancorp continued to be listless, falling 6 cents in trading yesterday to close at $12.43. Oneida Financial (ONFC) reported net income of 20 cents per share up from 9 cents in the year ago quarter. There are no estimates for ONFC. I would caution that Non-GAAP earnings, which excludes some non-cash items, was 18 cents for both quarters. 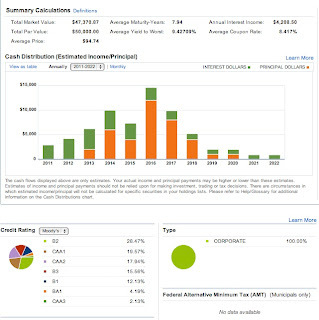 As of 3/31/2011, the total risk-based capital ratio was 15.44%; tangible book value per share was $8.74; tier 1 capital to risk-weighted assets was 14.3%; the allowance for loan losses as a percent of NPLs was a comforting 114.45%; NPLs to total loans was at 1.41%; NPAs to total assets was at 1.16%; tangible equity to tangible assets was at 9.36%; the efficiency ratio was too high at 80.01%; and the net interest margin was 3.33%. The quarterly dividend per share is currently 12 cents, resulting in a dividend yield close to 5.5% at a total cost of $8.75. Oneida Financial Corp, ONFC I own only 50 shares bought at $7.7. Oneida Financial closed at $8.89 in trading yesterday. F.N.B. Corporation reported net income of 17.2 million for the 1st quarter or 14 cents per share, compared to 14 cents in the 1st quarter of 2010. I have pared my position in FNB to just 50 shares purchased at $7.8. I sold my highest cost shares purchased at 9.36 and at 8.42, and do not intend to add to my remaining position. Sold 100 of FNB in 50 share lots at $10 and $10.18 At the current quarterly dividend rate of 12 cents per share, the dividend yield at a total cost of $7.8 is around 6.15%. At a total cost of $10.25, the yield is of course lower at around 4.69%. F N B Corp rose 27 cents yesterday to close at $10.85. Valley National Bancorp reported net income for the 1st quarter of 36.6 million or 22 cents per share, up from 16 cents in the 1st quarter of 2010. VLY is one of my larger positions in this basket. The consensus estimate was for 20 cents. As of 3/31/2011, the net interest margin was 3.71%; loans increased 7.7% on an annualized basis; the efficiency ratio was at 51.85%; the total capital ratio was at at 13.01%; the tier 1 risk-based capital ratio was 11%; Non-accrual loans as a percentage of total loans was at 1.06%; the allowance for loan losses as a percentage of non-accrual loans was a comforting 118.18%; and there is no government money on the balance sheet. VLY repurchased the government's preferred stock in 2009: Page 137 Form 10-K. The 2010 Annual Report can be found at FORM 10-K.
Valley has a good dividend yield and the Board will also declare a 5% stock dividend: Valley National Bancorp Board of Directors Declares a Five Percent Stock Dividend VLY operates 198 branches in 134 communities and is headquartered in Wayne, NJ. Valley National Bancorp rose 25 cents in trading yesterday to close at $14.2. Northrim BanCorp (NRIM) reported a 29% increase in net income to 2.5 million or 37 cents per share, compared to 1.8 million or 28 cents per share in the 1st quarter of 2010. The consensus estimate made by 2 analysts was for 31 cents. As of 3/31/2010, tangible book value per share was $17.13; the tangible common equity to tangible assets ratio was at 10.14%; the total capital ratio was at 16.23%; NPAs to total assets was at 2.02%; NPLs to total loans was as at 1.8%; the allowance for loan losses to NPLs was a comforting 128.42% (the "coverage ratio"); the net interest margin was relatively excellent at 4.72%; and the efficiency ratio was okay at 68.8%. I would like to see that number below 60%. Northrim Bancorp rose $1.05 to close at $19.35 yesterday, up 5.74%. I did not remember owning 50 shares in the ROTH IRA, but noticed those shares in my account this morning. The Gremlins must have bought those shares or the OG had one of those senior moments. The total JZV shares provided in the snapshot found at EXCHANGE TRADED BOND TABLE was consequently off by 50 shares. Prior to the sale of 120 shares, I actually owned 270 shares in 3 different accounts. This trust owns a senior CNA bond maturing in 2023. www.sec.gov The TC has a 7% coupon on a $25 par value. I sold the 70 shares held in the regular IRA and 50 shares bought in a satellite taxable account. Bought 70 JZV @ 24.14-Regular IRA Bought 50 TC JZV at 22.6 (6/2010 Post-Satellite account purchase). Of the 100 shares still owned, 50 shares were bought at $9.93 (March 2009 Post) after several successful trades of this security (see snapshot above which includes commission cost). Most likely, I am playing with the house's money on this one now, taking into account realized and interest payments. I noted that this TC was vulnerable to a call when I bought 50 shares recently in a taxable account. Item # 1 Bought 50 DKF at $25.52 ("DKF is vulnerable to a call at par value, plus accrued interest, by the owner of the call warrant attached to the TC.") I will take a small loss on the shares but that loss will be partially offset by the accrued interest payment. The price action on the day of my last purchase was consistent with some investors having advanced notice of a potential call. I have lost a large number of bonds to calls by the owner of the call warrant, far more than by the issuer of the bond. Cramer says everybody got "Alcoa wrong". Seeking Alpha Apparently, everybody does not include the OG and our Chief of Research LB. The 787 billion "stimulus" passed by the Democrats early in the Beanpole's administration is now winding down. While this stimulus did create some jobs, and prevented job losses at local governments by massive transfers of borrowed cash from the federal government, the stimulus was ill conceived and largely ineffective for the amount of borrowed money spent. The design of that package reflects a typical mind set of Democrats, which includes failing to consider the long term consequences of their actions. All of that money was borrowed, and the U.S. government will be paying interest on those borrowed funds for as long as the U.S. exists as a viable nation. Maybe the GOP needed to consider that point too before giving Bush Junior the go ahead to attack Iraq. Most of the "stimulus" money needed to be devoted to the nation's infrastructure projects (water, sewer, roads, bridges, etc.) that are in need of replacement or repair. Those expenditures would have to be done at some point anyway and would have provided a long term stimulus impact, lasting at least five years and possibly as many as ten. Infrastructure spending represented about 105 billion of the 787 billion and some of those projects are on their face questionable. Only 27.5 billion was devoted to bridge and highway construction projects and a much smaller amount to clearly identifiable water and sewer projects. Instead, to relieve what they consider to be suffering of some people, the Democrats spent most of that wad of cash with little of a non-temporary nature to show for it. Most of the tax incentives for example were temporary in nature or inefficient such as the homebuyer tax credit. Some of the funds were devoted to infrastructure projects, and some programs were funded that may have a longer term benefit such as the digitization of medical records or the energy efficient tax credits. But, a large chunk of the money was used to prevent government job losses at the local level, to provide temporary help for local government funding needs, and other transfer payments of a transitory nature. American Recovery and Reinvestment Act of 2009 Maybe those state and city workers could have learned how to use a shovel. Some sun and exercise could do wonders for them too, plus the added benefit of free Spanish lessons. Now, the GOP and the Democrats, each in their own grossly incompetent way, have managed to add close to 2 trillion to the nation's debt with just two stupid decisions. Based on history, more stupid decisions can be expected from them that will add to the deficit. 1. Pared Trade: Sold 100 Cominar REIT at 22.66 CAD and Bought Again the Canadian Dividend ETF CDZ:CA at 21.26 CAD Last Thursday (Canadian Dollar (CAD) Strategy)(see Disclaimer): In an opinion column in the last Sunday NYT, Reagan's former Budget Director, David Stockman, provides several reasons for my Canadian Dollar Strategy. Ultimately, I view it as highly unlikely that the U.S. will put its fiscal house in order, due in large part to failures by both political tribes and the unwillingness of the American people to change their entitlement mindset. Stockman describes the current reality as a The Bipartisan March to Fiscal Madness. I could not agree more, except that I would use stronger language than "Fiscal Madness". Financial Armageddon-Avoided or Just Delayed (December 2010); U.S. Debt to the Penny (Daily History Search Application) (Link to U.S. Treasury Calculation). The entitlement mindset of Americans exists in all income groups, but is most noticeable at the highest and lowest income levels. The rich do not see themselves as the beneficiaries of government entitlements. Perhaps, they need to cease funneling any money to GOP politicians and to lobbyists, and then they would be quickly reminded of the panoply of entitlements bestowed upon them. Eventually, sooner rather than later, the value of the dollar and U.S. debt will collapse due to profligacy of federal and local governments and an unwillingness of most Americans to live within their means or to pay taxes to support the liberal benefits promised by the government. Stockman's roadmap to prevent financial armageddon would be impossible to achieve politically. An example would be his proposal to increase taxes on the middle class in addition to the tax increases proposed by Obama on those deemed well off by the Democrats, or to end the lower tax rate for capital gains that Stockman calls a tax subsidy to the rich. Since neither political Tribe is even close to proposing workable solutions, and are highly unlikely to ever do so before it is too late, due largely to the American population's entitlement mindset, the inevitable result will be a collapse in the value of U.S. government debt, the value of the USD and most likely hyper inflation. Maybe this will not happen in five years or even ten. I am convinced that it will happen in my lifetime, and I view this outcome as close to inevitable. This is a link to the sponsor's web page: Claymore S&P/TSX Canadian Dividend ETF - CDZ - Claymore Investments, Inc. Dividends are paid monthly. The expense ratio is shown as .6%. The current holdings can be found at CDZ - Claymore S&P/TSX Canadian Dividend ETF. 2. Bought 30 New York Times at $8.61 on Thursday (LOTTERY TICKET strategy)(see Disclaimer): Yes I know. The newspaper business is dying. Even many educated young people are at best occasional readers of online newspaper editions and may never actually pay for a subscription in their lifetime. I know a few that would have to be paid to read a newspaper who attend some of the best universities. The problems originating from the internet, and the unwillingness of many to pay for access to a newspaper, are also well known. Another problem for a paper like the NYT is the long standing and successful strategy of the GOP to convince millions to ignore virtually all media outlets as biased organs of the liberal elite. This successful strategy, which started in earnest with Spiro Agnew, has reached the point where millions of Americans would never even read a newspaper like the NYT even if someone gave them a subscription, nor would they even consider going to the online edition even if access was totally free to them. I personally find the reporting to be excellent and would characterize the NYT as the best overall daily source for world news. I am a subscriber to that publication and many others. While I view information gathering as an obligation of my citizenship in a free society, it is imperative to being a successful investor. As a consequence of this relentless attack on the news media by the GOP and their media apparatchiks for over four decades, witnessed by me for my entire adult life, there are now tens of millions of U.S. citizens, who have an unshakeable belief that the New York Times, the Washington Post and virtually all media outlets in the country other than Fox "News" and right wing radio personalities like Rush Limbaugh, are incapable of reporting the news in an unbiased way. Conservative ideology has been hijacked in the U.S. by those who are boisterous, ignorant, closed minded, lacking in curiosity about the world, intolerant, in denial about their own glaring bias, often practitioners of the vitriolic spiel, and rigidly ideological. Those pseudo-conservatives will actively exclude any information that is not consistent with their previously formed ideological beliefs which requires them to ignore or to dismiss any information not disseminated in an accepted media outlet, which excludes virtually all news media with a few exceptions, the most prominent being the personalities at Fox "News". All information is screened through an ideological prism formed without much, if any, accurate information and what little information used to form their rigid and unassailable opinions can often be proved to be inaccurate, incomplete or a gross exaggeration. Part of the effort to exclude information and facts from consideration is done simply by placing a label on the source, like “liberal”, originating from any non-sanctioned outlet. The label, in and of itself, is to them a winning argument, the only thing needed to be said about it. Consequently, by successfully excluding reliable information from most of America's news media, they can successfully be manipulated to believe just about anything. The Birthers, who make up a clear majority of the modern day GOP, are simply one manifestation of the GOP's 40+ year campaign against the free press. Do NOT Consult the Free Press for Information is the GOP Message-Just Listen to Rush Limbaugh or Sean Hannity! For those indoctrinated in the GOP's line, and have already accepted as gospel the GOP's line about media bias, facts do not matter and no amount of facts could convince the Birthers that Obama was born in Hawaii. Instead, the overwhelming facts supporting his claim to have been born in Hawaii are the product of the liberal media who are just trying to mislead the Birthers. Each citizen has an obligation to make an active effort to discover the truth and that is a true conservative value. The Founding Fathers protected the press in the First Amendment, another conservative value, to further that truth seeking obligation of all citizens. Once the news stories are read, no matter the source, then a person can sift through them, separate the wheat from the chafe, fact from opinion, using all of the tools now available to a free person in a free society including the vast array of sources available over the internet, and then use their life experiences, knowledge and intelligence to make sense of it all. Sure, I see some bias in reporting, but that is after I read the article or listened to a news story. When you hear Republicans since Spiro Agnew repeatedly rail against the liberal and elite media, their ultimate goal for using these labels of “elite” or “liberal” is to convince people not even to access information to determine the truth for themselves and instead accept whatever version that they happen to be advocating at the moment without any effort to verify it. Their approach is at its heart and core anti-Conservative and anti-democratic in its purpose and intent and instead designed and intended to achieve a political goal, maintaining power by whatever means necessary. The millions who make no real effort to discover accurate information will not believe, for example, that the recently passed Ryan budget proposal, supported by virtually all House GOP members, would decrease the tax rates for millionaires again, while in effect imposing a 100% death tax on virtually all members of the middle class younger than 55. GOP Comes Out of the Closet on Medicare That last statement is based on the analysis made by the CBO that, by 2022, the seniors who are now under 55 will be paying almost twice as much as those under traditional medicare, so whatever amount is saved by the middle class before retirement would likely be devoured before their death to pay spiraling increases in private health insurance. I do not believe that the number could be seriously disputed and I suspect that it would end up being much worse for those folks now under 55. Yet, the GOP wants to end the estate tax for billionaires (currently there is a five million dollar estate tax exemption that can be doubled with a by-pass trust) A GOP politician would not want to have to explain that vote to the middle class voters that normally support them, and most likely most will not have to defend their vote due to the voter's lack of accurate information. 1. The availability of free alternative news outlets on the internet which includes free access to online editions of newspapers. 2. The successful 4+ decade campaign by the GOP to convince millions to refrain from even accessing the "mainstream" media outlets, so that the GOP message will not be contradicted by facts. This results in fewer readers for newspapers or viewers for online editions of most media publications. 3. The unwillingness of younger readers to read, let alone, subscribe to a newspaper. The NYT does, however, have a number of important factors in its favor. There are also millions of Americans who remain open-minded and curious about world news. The NYT may be the only national paper that can successfully navigate to an online subscription model. The paper has recently started to charge for online access, but is now allowing access to 20 articles a month for free. After the recent transition to the paywall, 100,000 free loaders opted to pay for online access. Bloomberg An improving economy will lead to some modest improvement in advertising sales. I bought the stock last Thursday after the shares slid in response to the latest disappointing earnings report: SEC Filed Press Release The shares fell to an intra-day low of $8.54 before recovering to close at $8.92. The current consensus estimate is for an E.P.S. of 54 cents in 2011 and 72 cents in 2012. In addition to the NYT, the company also owns the Boston Globe, 14 regional newspapers, and several web sites including About.com. 3. 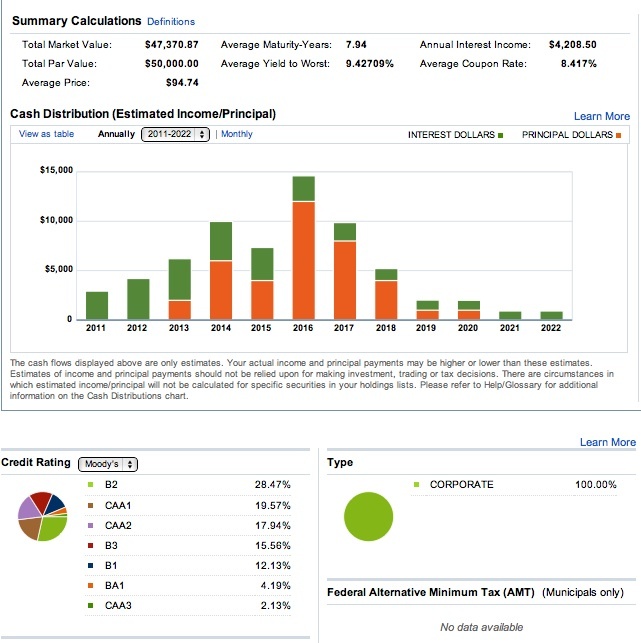 Washington Trust (WASH)(own-Regional Bank Stocks' basket strategy): Washington Trust reported 1st quarter net income of 6.8 million or 42 cents per share, up 31% from the 5.2 million earned in the 1st quarter of 2011. The consensus estimate made by 3 analysts was for 40 cents. Net interest margin improved to 3.16% from 2.78% in the 1st quarter of 2010. As of 3/31/2011, NPAs to total assets was an excellent .77%; the tangible equity to tangible assets ratio was 7.36%, up from 7.14% as of 12/31/2010; the tier 1 risk based capital ratio was 11.65%; the total risk based capital ratio was 12.92%; no government preferred stock is on the balance sheet contributing to equity; and the allowance for loan losses as a percentage of NPLs was a comforting 1.43%. I bought 100 shares of WASH at $15.26 and sold 50 of those shares at $22.44. 4. Sold 100 Enterprise Bancorp (EBTC) at $15.95 (Regional Bank Stocks' basket strategy): Enterprise Bancorp reported net income of 2.5 million or 26 cents per share, down from 2.9 million or 32 cents in the 1st quarter of 2010. The decline was due mainly to the levels of gains from security sales and foreclosed real estate in the 2010 quarter. Still, this report was not impressive. NPAs increased to 1.67% from 1.51% as of 12/31/2010. The net interest margin remained relatively good at 4.43%. EBTC closed at $16.10 in trading yesterday. The dividend yields shown in this table are calculated by YF at the closing price from yesterday. My dividend yield would in most cases be higher, sometimes much higher. For multiple purchases, I use a weighted average cost and use the purchase date of the last trade as the trade date. I have two problem children in this basket, HCBK and PBIB. 5. Bought 1 Knight Ridder 5.75% Senior Bond Maturing 9/1/2017 at 85 on Monday) (Junk Bond Ladder Strategy) (see Disclaimer): This bond is currently rated at Caa2 by Moody's and CCC+ by S & P, well into junk territory and deservedly so. The Knight Ridder newspaper chain was bought by the McClatchy Company (MNI) in 2006 for 4 billion in cash and stock, when it was well known that the internet would be a growing negative influence on newspaper profitability. MNI also assumed 2 billion in debt. Boneheaded is the only appropriate description. At one point in 2008, MNI common stock fell below $1 per share, down then over 98% since the Knight Ridder acquisition. The entire market value of MNI's common stock now is less than 300 million. While some papers were sold, McClatchy retained ownership in 20 former Knight Ridder publications: "The Tribune in San Luis Obispo, Calif.; The Bellingham Herald and The Olympian in Washington; The Idaho Statesman in Boise; The Kansas City Star in Missouri; The Olathe News and The Wichita Eagle in Kansas; the Fort Worth Star-Telegram in Texas; the Belleville News-Democrat in Illinois; the Columbus Ledger-Enquirer and The Telegraph in Georgia; the Sun Herald in Biloxi, Miss. ; the Lexington Herald-Leader in Kentucky; the Centre Daily Times in Pennsylvania; The Miami Herald, Bradenton Herald and El Nuevo Herald in Florida; The Charlotte Observer in North Carolina; and The Sun News and The State in South Carolina." The McClatchy Company This acquisition added way too much debt in my opinion to MNI's balance sheet and it is still struggling under that weight. The 2010 Annual report shows 1.703 billion dollars in long term debt. (page 43). The maturity schedule can be found at pages 54-57. Both the amount and maturity date of a senior secured note is important. That notes has almost 866 million in principal amount outstanding and matures in February 2017. This makes my senior unsecured note very risky without any doubt in my mind. The same negative trends discussed in Item # 2 above would also be applicable to McClathchy's newspaper operations. In all of the papers shown at page 6 of the Annual Report, subscriptions are in decline. The company did earn 39 cents per share from continuing operations in 2010. This is a link to the FINRA Information on the 5.75% senior unsecured bond maturing in 9/2017.